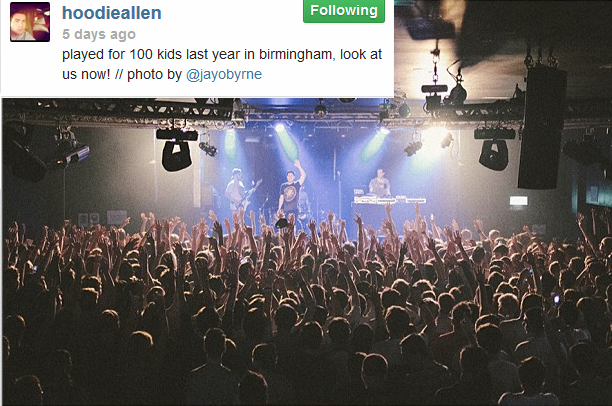 Ever the showman, Hoodie Allen produced a memorable night from beginning to end with a vibrant, excitable performance. The small venue (an smaller offset room from the main stage) only enhanced the booming atmosphere that the presence of the All-American rapper created. His second visit to the UK has built upon his success and just shows the likeable appeal of both his personality and his music. Finally, Hoodie entered the stage to a rapturous applause alongside his DJ and his guitarist, Kyle (affectionately known as Paedo for reasons unknown). After his performance he showed he’s just as good, if not better live. He performed several of his songs with great crowd interaction, highlights being the orchestrated waving in ‘James Franco’, and my personal favourite when he threw a damn cake into the crowd which was subsequently caught, eaten slightly and shared around in ‘Cake Boy’! There was a great exclusive for the Birmingham crowd as Hoodie performed an acoustic version of crowd favourite ‘The Chase Is On’. Undoubtedly a great gig enjoyed by everyone in attendance and I hope that Hoodie is tempted back to the UK once again in the near future! Cheers for reading guys. If you have anything to add or discuss then be sure to leave a comment here or send us a tweet to @Clinture. Please share and subscribe! This entry was posted in Uncategorized and tagged atmosphere, awesome, concert, crowd, dance, discover, festival, fun, gig, great, hip hop, hiphop, hoodie, hoodie allen, indie, indie rock, like, live, live music, music, new, rap, real, rock, share, subscribe, twitter, vintage. Bookmark the permalink.